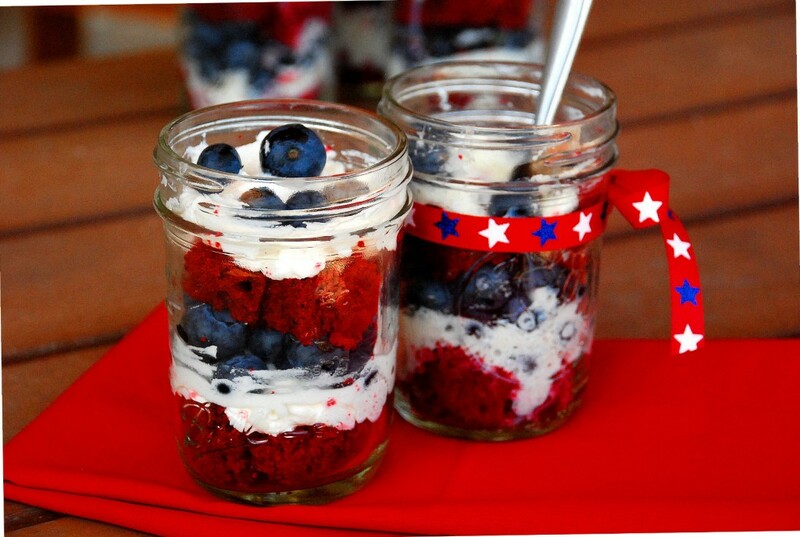 There are lots of great recipes for red, white and blue trifles out there, but sadly most of them use strawberries, blueberries and whipped cream. I mean, with all that fruit those trifles are practically a healthy dessert. Where’s the beef? And by that I mean, where’s the CAKE? That’s right, if this is dessert there’d better be some friggin’ cake. So I switched it up and ditched the strawberries in favor of the good stuff – red velvet cake. The result is a delicious, totally make-ahead treat that can sit in your fridge while you enjoy those fireworks. Bring out a tray of these for the finale and your guests will forget all about the light show in the sky. p.s. I hate to say it, but a boxed mix is really the best for this recipe. It provides that true red color that can only be achieved via food coloring and artificial stuff. Just this once. Bake red velvet cake according to package directions for a 9x13 pan. You will only need 1/2 of the red velvet cake for these trifles, so freeze the rest for later (or do what I did and make extra whipped cream and eat the leftover cake for lunch). Cut 1/2 of cake into 1-inch cubes. (The smaller the better and don't be afraid to stuff 'em in the jars to make the layers even.) 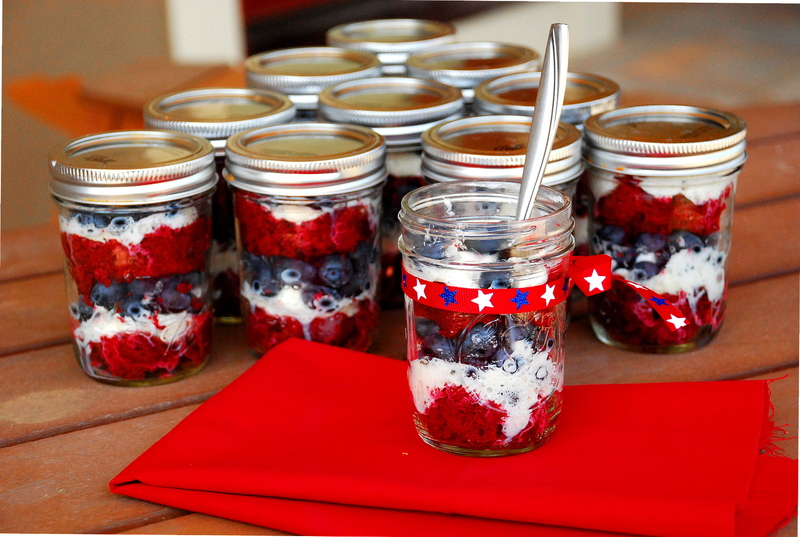 Starting with cake pieces, layer evenly with whipped cream and blueberries in glass jars. Place the lids on and refrigerate 'til ready to serve.